ISON is inbound for a fly-bye. There were major solar flares as ISON passed close to the Sun. Back in August, NASA said, if you believe them, that the Sun was due for a magnetic pole shift in 3-4 months. Do the math. A solar magnetic pole shift will effect Earth's magnetoshere which is already in flux with an accelerated magnetic pole shift. ISON brings its own magnetics into the equation. 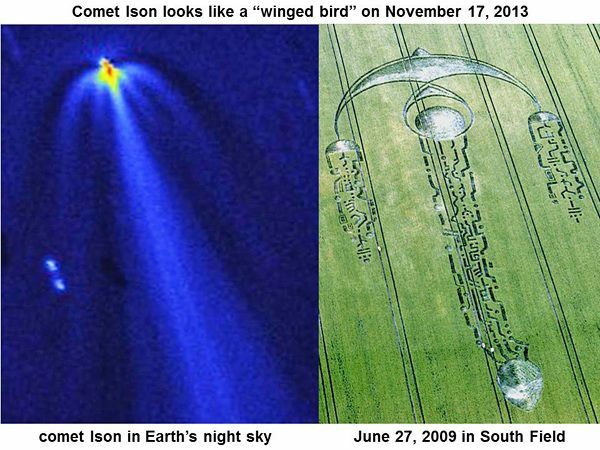 ISON is highly charged with plasma energies that NASA ignores, covering up the massive plasma discharge when ISON passed Mars. The quantum field of cosmic rays can be host to a variety of influences on consciousness that modern science barely understands. See 'Nonlinear Perception'. Earth's increased wobble on it's axis is causing weather weirdness with an up-tick in volcanism and earthquakes. December 23, 2013 is the 100th Anniversary of the Federal Reserve Act which privatized the U.S. Treasury for the bankster cabal behind endless wars for profit without Constitutional principle. Perhaps this too shall pass... one way or the other. simple, fluid, kind, and fearless." ISON Now Measured And Verified As A Planetoid? Planet X? Mandela actually died back in June, as documented in the 1st and middle part of the video. At 4 minutes, the video goes into Comet Ison, the so-called "Comet of the Century", and the underground shelters for the ANC elite. This may all sound too bizarre if you didn't know the unsanitized background story of Nelson Mandela as is well explained by Stephen Lendman HERE. At 7 minutes the video goes into Planet X, going on to explain how the ANC rulers (like US rulers) were 'bought off' with shelter security if they played along with the hoax that 'all is well' with democracy under the new "privatized" (fascist) slavery with a good Mandela/Obama face. The Mandela funeral TV spectacle was a mass 'feel good' diversion from reality, as fake as was the fake sign language translator beside the fake President Obama, another psy-ops piece of work. In the meantime, weather weirdness is getting extreme with increasing wobble of the Earth's axis as precedes pole shift. It just snowed in parts of Egypt for the first time in 110 years. Earthquakes and volcanism picking up worldwide. See recent ZetaTalk articles for Earth changes updates. Planet X? Merry Xmas? 'Christ Mass Co-Creation'? Or is this a non-event? PS: Keep your immune system strong for stress management. Joy provides spiritual immunity and SPX helps physically. Double-up on SPX during the holidays if stressed. Synergize SPX with a 'Super-Immunity Combo'.